The Hot Rods fiished the week with a 4-1 record and headed into the All-Star Break with a 41-29 record on the season. 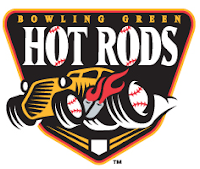 The Hot Rods win on Sunday clinched the Eastern Division title and guarenteed them a spot in the playoffs. It is the first division title in franchise history. Transactions: Wilking Rodriguez transferred to Hudson Valley (6/17/11). Disabled List: Jairo De La Rosa and Will Kline. The Week Ahead: 6/22/11-6/23/11: Day Off. 6/24/11-6/26/11: vs Dayton Dragons (35-35). 6/27/11-6/29/11: at Great Lakes Loons (39-30). Phil Wunderlich also has 10 homers. has anyone see CJ Refeinhauser pitch? He has statistically looked very good and consistent this year. Without reading any first hand reports he has soared up my prospect list for the Rays. I have seen C.J. pitch all of his home games this year. I am not a scout or a talent evaluator but here is my take. C.J. throws a fast ball, sinker (two-seam fb), slider and a change. He has very good command of all four pitches and mixes them up to keep hitters off balance. His fastball usually sits at 89 and the max on the B.G. scoreboard gun has been 91. He does not have the velocity of Romero or Lara but he knows how to pitch. Just watching him work it appears to me that his fastball is faster than it registers because he mixes his pitches so well.